At ProSource® of Bridgeville, we’ve got the bathroom remodeling products you are dreaming of at prices that’ll make your wallet happy too. Visit our showroom today to meet with a bathroom design specialist to create a room that’s functional and appealing. Sinks are an easy way to improve the appearance of any bathroom. 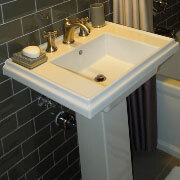 At ProSource you’ll find bathroom sinks of all shapes, sizes, and styles. Ask our specialists about sinks that can be mounted above or below the counter, as well as our attractive pedestal-mounted options. 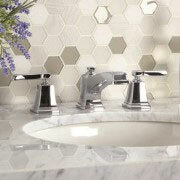 Accent a new bathroom sink with a luxurious new faucet. The faucet in a remodeled bathroom helps to bring together the aesthetic and appearance of the rest of the space. It can also serve as a fun conversation piece for guests. Few things beat the feeling of a long shower after a hard day. The only thing better is a remodeled shower made even more relaxing by the products at ProSource. We have the shower heads, handles, doors, and bases that you want. Even the largest of bathroom can benefit from having added storage space. 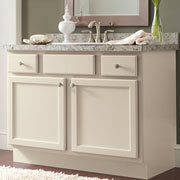 Why not add a beautiful new vanity to your bathroom remodeling designs? A vanity provides valuable counter space to pair with storage, creating a pleasing new space for bathroom essentials. Our range of bathtubs is diverse, ranging from jacuzzi to stand-up to combination-style tubs that can fit into any bathroom remodeling project. 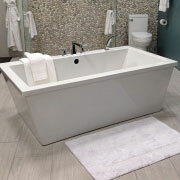 Meet with a bathroom design specialist to sort through our array of tub choices. 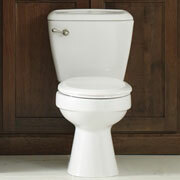 The toilet holds a central place in any bathroom. When you’re remodeling a bathroom, make sure to consider a sleek toilet that takes advantage of new innovations, like low-flow options that are eco-friendly.